Cruise only price does not include arrival/departure transfers. Passengers arriving to Amsterdam on Day 2 should select flights that arrive no later than 4:00 pm. Embarkation will begin at 2:00 pm however early arrivals may rest in the lounge if their assigned cabin is not ready upon check-in. 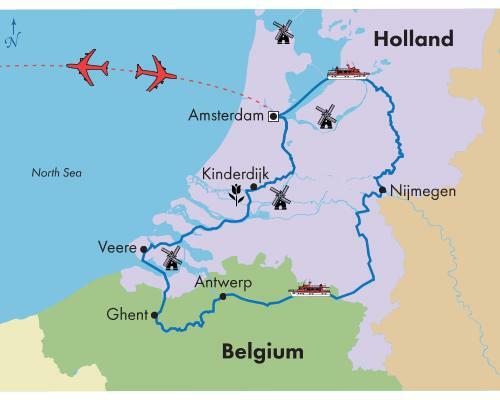 Apr 20 departure on the Monarch Countess will have an alternate itinerary due to the Celebration of King's Day in Amsterdam. Please see the itinerary tab for more information. Due to physical constraints and space limitations, wheelchairs and walkers are not allowed on motor coaches and/or river cruises. There are no elevators or chair lifts on board. While sailing with Monarch Cruises, passengers are subject to the cruise's Terms & Conditions.